Every person who creates or gives to a CFA fund has a direct impact on our community. Together, we’re empowering economic opportunity, educational services, arts and cultural programs, environmental clean-up and sustainability, outdoor activity, health services, community development, and much much more. The Community Foundation offers a variety of fund types, each designed to meet the specific goals of the donor. Learn more about each type by browsing through the different funds listed here, and then contact Paula Hencel, our Donor Services Officer, at 814-209-8663 to discuss how we can help you to perpetuate your philanthropic interests. Administrative Funds – This type of fund is for donors who wish to invest in the Community Foundation and further its charitable purposes by helping to defray its expenses. The long-term goal of the Community Foundation is to be supported entirely by its administrative endowment fund. Agency Funds – Benefit a pre-determined nonprofit by providing ongoing support, while the CFA handles investments and administrative responsibilities, allowing the organization to focus on their mission. Donor Advised Funds – Donors enjoy administrative convenience, cost savings, and tax advantages. Each year, they recommend nonprofits in which they want to invest, and the CFA does all the work in administering those grants. Designated Funds – Donors may support up to four specific charitable organizations, responsive to changing circumstances. Donor Privacy Statement – Your right to privacy is very important to us. We recognize that providing the CFA with your personal information is an act of trust. The CFA does not share personal information, except as required by governmental entities or legal process. Click here to read the privacy statement in full. Field of Interest Funds – This type of fund allows donors to identify an area of personal interest, such as the arts, economic development, education, the environment, health, housing, basic human services, seniors, or youth. Within that area of interest, the Foundation identifies the best philanthropic use of the fund’s distributions, now and into the future. Partnership Funds – With these funds, the CFA accepts donations and funding is redistributed to benefit local initiatives. Scholarship Funds – Scholarships are established to honor loved ones, inspire young people, and invest in the community’s future. Distribution Committee – These funds provide flexibility by allowing our Distribution Committee and staff to use their knowledge and expertise in determining which efforts or initiatives would be most impactful for the community. These funds address our community’s pressing needs and promising opportunities. We receive more than 200 applications annually from local nonprofits seeking these funds. The following names represent donors who gave during the fiscal year which ended June 30, 2018. The Community Foundation for the Alleghenies regrets any errors or omissions. Please notify us immediately so that we may address your interests. 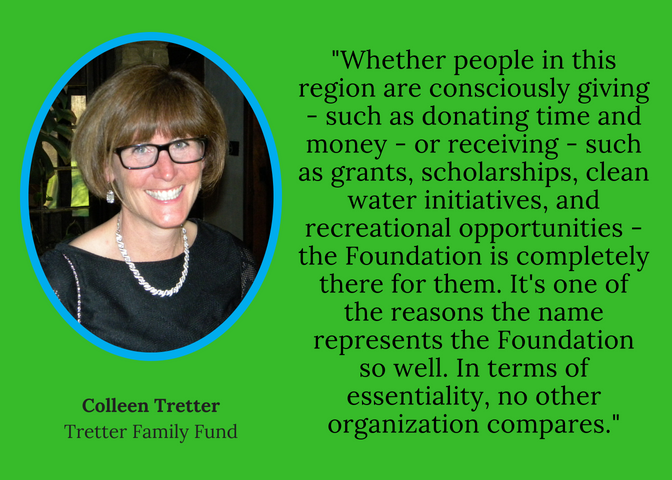 The Community Foundation for the Alleghenies generally does not allow its name to be used in connection with fundraising being done by outside organizations. We do make exceptions for fundraising intended to increase the assets of a CFA-managed fund. In such cases, please submit your event in advance for the Foundation’s review. The Community Foundation collaborates with its funds on promoting these fundraisers and events. This promotion supplements and enhances any marketing implemented by the funds themselves. CFA staff members do not fundraise for individual CFA funds. The following policies and guidelines have been developed to protect you and your fundraising group, and to assure a successful outcome for both you and the Community Foundation for the Alleghenies. Before undertaking any fundraising events or producing any materials which contain the CFA name of logo, please contact Donor Services Officer Paula Hencel (814-536-7741), who will work with you to submit a fundraising application and budget. The project will be evaluated on its appropriateness, feasibility, practicability, and potential liability concerns. Click here to submit your event electronically to our staff. Here’s a checklist of items to be completed for your successful event. The purpose of these policies and procedures is to provide guidelines for staff members, volunteers, and others who engage in fundraising activities for the benefit of and under the auspices of the Community Foundation for the Alleghenies. These policies and procedures apply to all fundraising, gift acceptance, and communication with donors or prospective donors. The intent of these policies is to ensure that donor’s wishes can be honored, community needs will be addressed, and the provisions of gifts are consistent with the Foundation’s overall mission. All efforts within the Community Foundation to raise funds from private and public sources (individuals, corporations, foundations, trusts and others) for endowed or pass-through funds must be coordinated through the Executive Director and/or the Senior Director of Donor Relations. Failure to coordinate fundraising activities may result in more than one individual or organization approaching a potential gift source at the same time. The result can be: confusion, embarrassment to the Community Foundation, an agency and the potential donor, and duplication of effort. Donors expect the Community Foundation to determine its priorities and make a single coordinated approach. Within the framework of priorities established by the Board of Directors and various committees of the Board, staff members will consult with those wishing to approach a funding source to determine the appropriate timing in light of Community Foundation, as well as community-wide, priorities. For more information about donating, please contact Paula L. Hencel at (814) 209-8663.